Abu Dhabi is the capital of the United Arab Emirates (UAE) and is a perfect destination for family and friends. 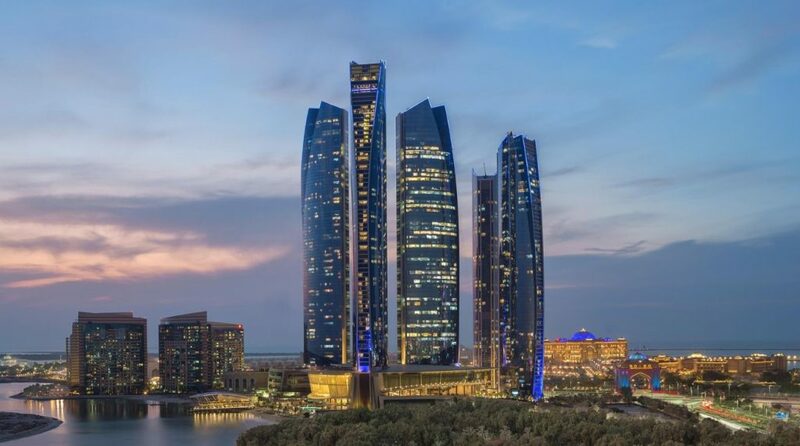 If you are planning to visit Abu Dhabi for the first time and are interested in seeing Abu Dhabi’s top tourist attractions then you have reached the right post. 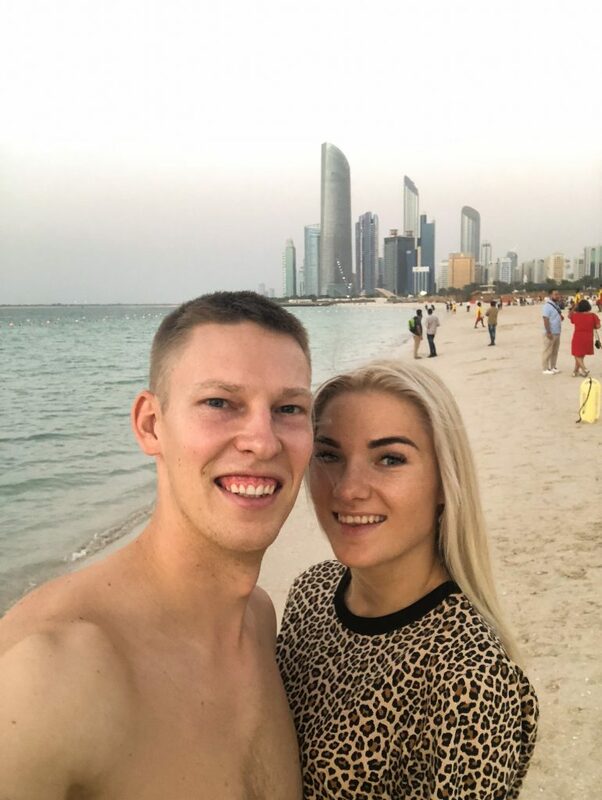 Usually, travelers are confused about what things to do in Abu Dhabi as they do not want to miss any of the attractions and go straight to Dubai. That’s why I am here to share all the info you may need! 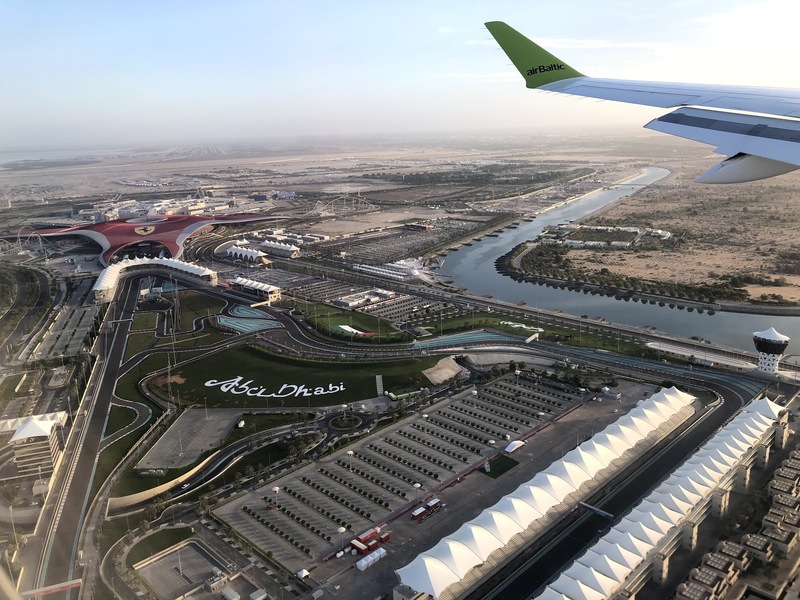 If you enjoy watching Formula 1 races and want to race like the professional racers then you must visit the Yas Marina Circuit. The Yas Marina Circuit is considered to be one of the most technologically innovative racing venues in the world. The venue hosts Formula 1 Races and Grand Prix. However, when the venue is not holding any events, it is open for visitors to test out the racing track. You can select any of the varied kinds of vehicles available through their official website and just go zoom! 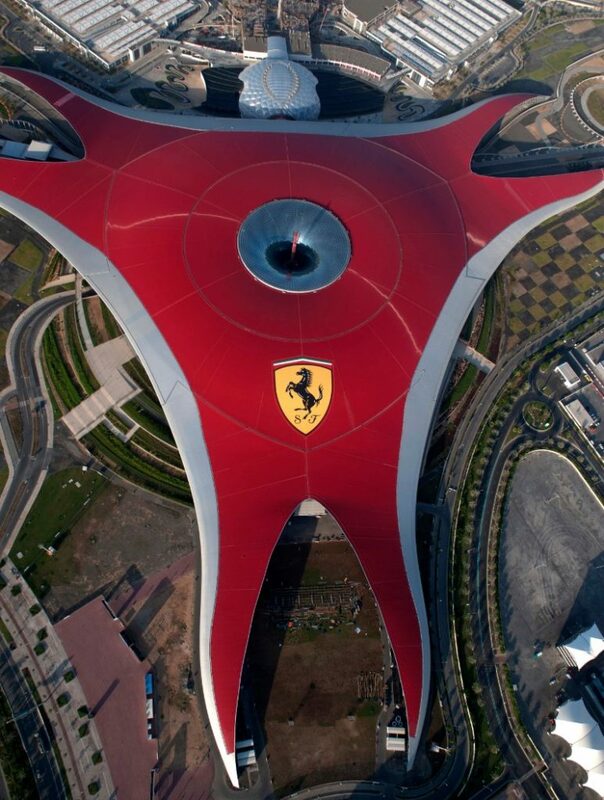 Located to the north of Yas Marina Circuit is the Ferrari World Abu Dhabi, which is an amusement park for all ages. The park consists of 19 different attractions that will require an entire day to explore and enjoy. It features ‘The Formula Rossa’, which is one of the world’s fastest rollercoaster that can travel up to 150 miles per hour. Another interesting attraction is the Speed of Magic, which is a 4D simulator that will take you around a volcano and through thick jungles. The park is open on all days and the timings to visit are from 11am to 8pm. There are several events held on a regular basis, which can be checked on the official webpage of Ferrari World, Abu Dhabi. 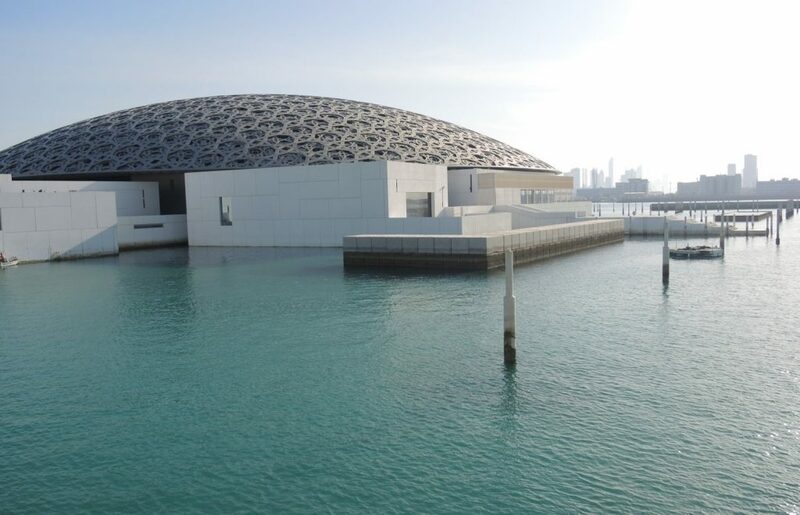 Located on the Saadiyat Island, the Louvre Abu Dhabi is a massive art and civilization museum. It is considered to be the largest art museum in the Arabian Peninsula, which displays artworks from across the world. The entrance ticket costs 63 AED for adults above the age of 22 years. The admission will provide you access to exhibitions, museum galleries, children’s museum, and public spaces that are available underneath the dome. Youngsters between the age group of 13 to 22 years have to buy entrance tickets that cost 31.5 AED. Children below the age of 13 years, journalists, and disabled visitors with a companion can enter Louvre Abu Dhabi for free. The museum is open on all days except Monday. There are different timings for visiting museum galleries, museum boutique, museum café, etc. so you should check the timings on their official website before planning for a day out. If you want to visit one of the largest mosques in the world then head straight to the Sheikh Zayed Grand Mosque. To view the entire mosque, you will require at least an hour. You can either book a guide to accompany you or explore the mosque on your own. Among one of the finest Abu Dhabi attractions, Sheikh Zayed Grand Mosque is a must-visit place for all tourists. It features 82 domes and its wonderful architecture represents three Islamic dynasties. The Sheikh Zayed Mosque is one of the only two mosques in Abu Dhabi that offer entry to non-Muslims. 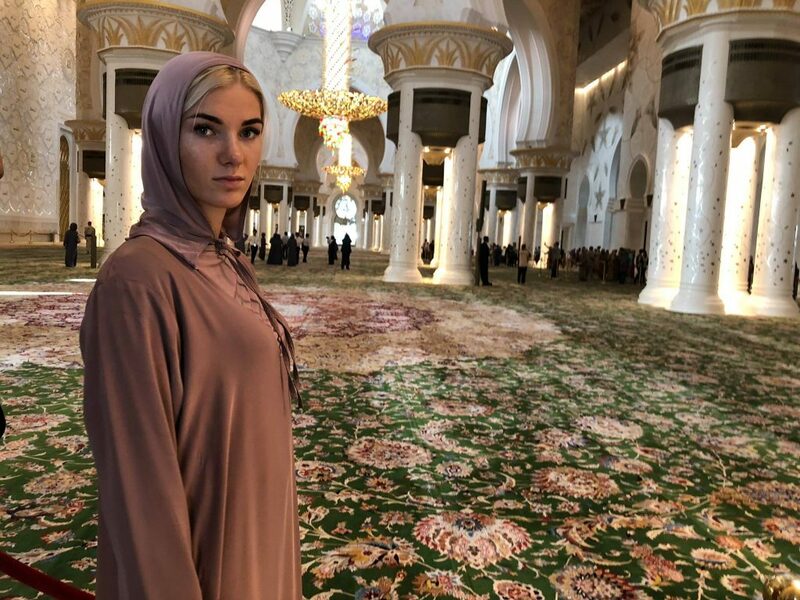 Travelers from across the globe visit the mosque to view its architecture, hand-woven rug, and wonderful décor that also has one of the world’s largest chandeliers. You can visit the mosque between 9am to 10pm from Saturday to Thursday. On Friday mornings, the Grand Mosque, Abu Dhabi is open only for worship and not for tourists. In the evening, the mosque reopens for tourists after 4:30 pm. 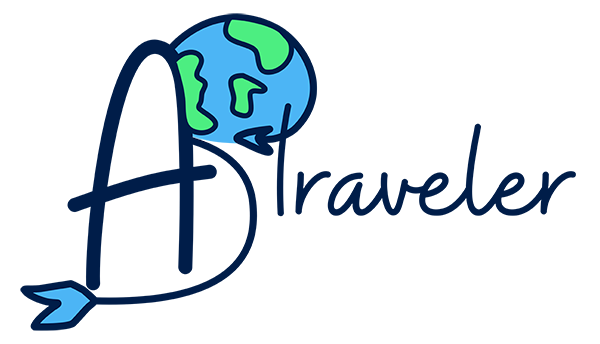 There are several events and activities held in the mosque, which can be known in detail by visiting their website. Also note that the entry timings change during the Holy Month of Ramadan, so check it before visiting the Abu Dhabi Mosque. Another thing you should keep in mind that you have to cover your body and can’t show your knees, shoulders or wear anything that is too tight. For men, you have to just wear pants and something that covers shoulders, but women have to cover their hair as well. Even though it may sound complicated, don’t worry! If you don’t have proper clothing you’ll get everything you need for free at the entrance. Burj Mohammed Bin Rashid:381 meters tall, the Burj Mohammed Bin Rashid is at present the tallest structure of Abu Dhabi. This world famous residential building stands proudly inside the World Trade Center Abu Dhabi complex. It consists of 474 residences that have been beautifully built across 92 floors. You can visit the World Trade Center complex to view its beautiful architecture, shop in the mall, dine in various restaurants, or simply book a stay in Courtyard by Marriot. Etihad Towers: The Etihad Towers consists of five structures built close by that looks like tall grasses touching the Abu Dhabi skyline. The towers comprises of three residential buildings, a 5-star Jumeirah hotel, and a structure for commercial purposes. You can have a glimpse of amazing views of the Arabian Sea and the vibrant city from the towers. To have a luxurious stay in Abu Dhabi, you can consider booking a room in the Jumeirah hotel or gift your loved ones a home in its lavish residences. City Of Lights C1 Tower: About 282 meters high, the City Of Lights C1 Tower is a 62 storey commercial complex. It is built in the City Of Lights community on Reem Island, which is under-construction and comprises of residential towers, commercial buildings, parks, hotels, marina facilities, and much more. Built on 140 acres of land, the community is going to be one of the finest Abu Dhabi attractions. The Corniche Road, Abu Dhabi is an impressive 8km long stretch that comprises of cycle paths, play area for children, pedestrian pathways, cafés, fountains, restaurants, Corniche beach, and much more. The Corniche beach is one of the most popular tourist attractions in Abu Dhabi. There are several lifeguards on the beach to keep your family safe. The Corniche Abu Dhabi has acquired the Blue Flag status, which means that the beach water is extremely clean and safe for swimming. The beach is divided into three sections, which comprises of general public, families, and singles. Make sure you don’t come to the beach too late. I went there about 5 pm. prepared for swimming, got into water and after few minutes I had to get out. You can’t swim or dive into the water after the sunset. Situated next to the Park Hyatt Abu Dhabi, the Saadiyat Public Beach is a perfect recreation place to visit with family. You can swim with your kids on the beach till they get completely tired and then relax on the loungers available on the beautiful white sands. For a small price, you can avail facilities such as lockers, showers, changing rooms, etc. During the weeks you can join one of the beach yoga classes that are held by professional yoga gurus. Moreover, at Saadiyat Public Beach you can even do some water sports activities such as sailing and windsurfing. The Al Bateen is a family beach that offers amazing views of the Hudariyat Bridge. After spending family time at this wonderful beach, you can hire a stand up paddleboard, a kayak, or jet-skis for some fun time on the water. There are several lifeguards on the beach that work relentlessly from 8am until sunset. If you enjoy fishing then you can try your luck in the Al Bateen beach. Some more activities that you can participate here are beach volleyball, water sports, etc. Located on Khalifa Al Mubarak Street, the beach is open every day from 8am till sunset. Situated on the famous Corniche Road Abu Dhabi, the Corniche Hotel offers 305 luxurious rooms for guests. The rooms provide mesmerizing views of the Arabian Gulf as well as the Capital Garden. 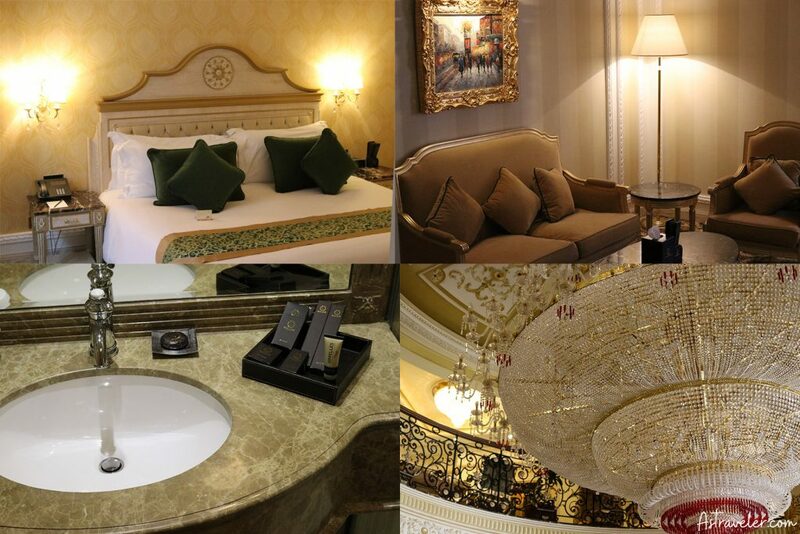 If you want to have a luxurious stay in the heart of Abu Dhabi then you should book a room here. You will be provided with a variety of dining options, so you can select the one that suits your palate. If you want to indulge in authentic dishes then you should visit Marakesh restaurant and if you want to have wood fried pizzas then head to Biscotti. To relish the local cuisine as well as international dishes, you should visit the Citrus. The Royal Rose Hotel is a lavish 5-star hotel, which is a mere five-minute drive away from Corniche Abu Dhabi. Although it provides luxurious facilities, the rooms are available for an affordable price. The hotel consists of 355 beautifully furnished rooms and suites. Some of the wonderful facilities that you will receive here are free Wi-Fi, electronic locker, satellite TV channels, tea and coffee making facilities in the room, and much more. You can either select their Deluxe Room, Grand Deluxe King Room, Family Room, Boutique Suite, Luxury Suite, or Rose Suite depending on your preferences and budget. We have booked Rose Suit, however, we came too early before the check-in time and because of that, we were given an even better room which was Luxury Suite. The staff, location, and facilities of this hotel are just amazing. More than that you can enjoy the pool at the rooftop. All this luxury didn’t even cost us 100 euro/night so highly recommended! 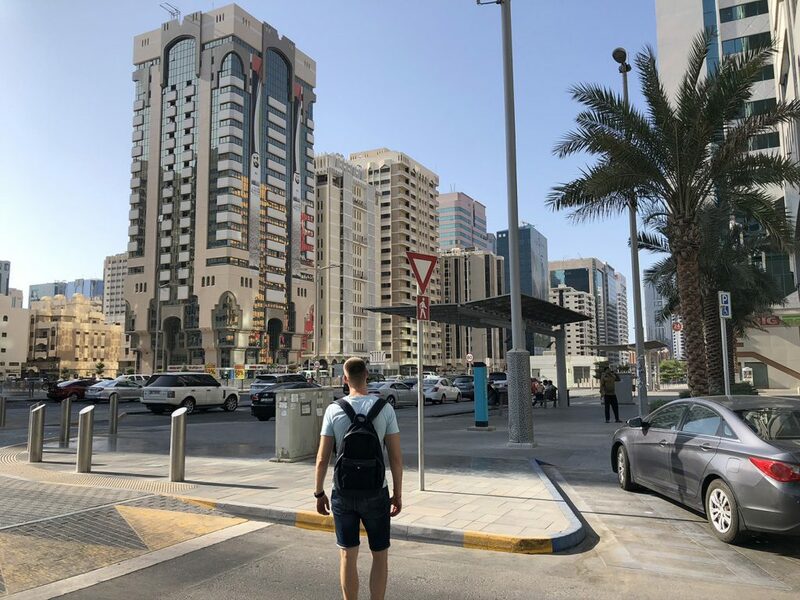 If you are traveling on a budget and are looking for affordable accommodation with minimal facilities then you should check out the BackPacker Hostel in Abu Dhabi. The hostel is located in the centre of the city and has several local shops, restaurants, shopping malls, bakeries, etc. in close vicinity. Within the hostel’s building there is a restaurant too, so you can even have authentic dishes out there instead of stepping out. The Corniche Abu Dhabi is in walking distance of the hostel. There are several bunk beds put up in the dorm rooms and a private locker is provided to each guest for keeping their valuables safely. The Abu Dhabi City Bus service is the easiest and cheapest way to travel in the city. The local buses connect to several routes across the city and operate round the clock. All buses are fully air-conditioned; thus, providing a relief to travelers from the sweltering heat in summers. People with disabilities and senior citizens above the age of 60 years can travel in any of the local buses for free of cost. To view a detailed timetable of the bus routes and its fare, kindly visit their official webpage. Also, get information on the ‘Big Bus Tour’ facility provided for tourists, which can help you to explore the best places of the city in a single day. To travel around the city, you can even book a taxi. You can either hail a cab from anywhere in the city or book one online. Some of the travelers prefer using app cabs like Careem to book a taxi for traveling in Abu Dhabi. The public taxis are metered and a cheap way to explore various places in Abu Dhabi. So, you do not have to negotiate with the drivers at all. Just pay whatever fare is shown on the meter. The vehicle in the form of taxis is silver colored cars and silver or black colored minibus. You will find several taxis waiting outside the airport for your convenience. As they are not allowed to come and approach you, you can go and approach them. Taxi service in UAE really impressed us not only with the cheap fares but also new cars and quality. It’s so convenient and cheap to use so you can travel around the city like a boss. If you are traveling two or more, I highly recommend using only taxis. You can even travel from Abu Dhabi to Dubai using a taxi. It is about 1 hour and 20 minutes drive that costs 50-70 Euro on any taxi that is metered. If you want to visit the Delma Island and return back to the city in a single day then you can make use of the ferry services. Each day, there are two passenger and vehicle ferries that go to Delma Island. One ferry starts from Mugharaq Port while the other one starts its journey from Delma Island Port. Kids aged below 12 years can travel in the ferry for free of cost. People above the age of 12 years have to pay 20 AED each. If you are taking your vehicle along then you need to pay 100 AED as vehicle conveyance charges. Before planning for a trip, check out the Delma Ferries Schedule. If you need any medical help during your trip to Abu Dhabi then you can visit the famous Cleveland Clinic Abu Dhabi. It is a multi-specialty hospital, which is part of the Cleveland Clinic Foundation, USA. While traveling in the local conveyances like taxis or buses, it is advisable to keep some Abu Dhabi currency in hand as they do not accept credit cards. As Abu Dhabi is a Muslim City, it is advisable to respect their customs and dress up and behave appropriately. To conclude, the best time to visit Abu Dhabi is during November and the whole winter. Summers in Abu Dhabi are very hot with plenty of sandstorms so it is advisable not to visit during June to August. The local currency of Abu Dhabi is UAE Dirham, which is abbreviated as AED or Dhs. So, pack your travel luggage and get ready for an awesome holiday.